Here's where I get the chance to brag on my students a little bit! They have all worked really hard in spite of the constant rain early this spring and I was very pleased with the way they handled new experiences and unexpected situations at the first POAC show of the season in Shelbyville at Clearview Farm. Our newest leadliner, Laney Beth Copeland, made her show debut at the TN POAC show in April and really enjoyed it! 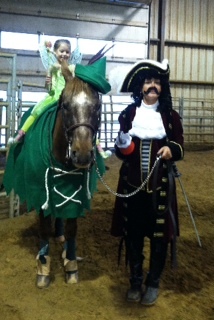 She and I got lots of compliments on our Peter Pan, Tinker Bell, and Captain Hook costume. Of course, Laney looks like Tink even when she isn't in costume, so it was an easy sell! ha ha Thanks to my Mom and Grandmom for all the help with the costumes and to Laney's grandmother, Elaine, for helping bring it all together! Laney was proud to bring home her share of blue and red ribbons in Leadline Equitation, Leadline Showmanship and costume. We will be adding Trail and the games classes at the June show. We were proud of her and expect her performance to improve at each show. Emma Tolbert and Dallas has a good day on Saturday. They were a new team. Emma had to leave early since her sister came down with strep, so she didn't show on Sunday. Kaitlyn Madson and Zip had a good show on Saturday, but she went home sick on Sunday. Thankfully she is feeling much better and has continued to practice and practice. She is looking forward to showing again in June. My intern, Hannah Dickson, had a good show riding the Sims' young mare, Mimi. She has since moved to riding our newest purchase, Dallas, and will be showing him the rest of the season. Keep your eye on this pair. They are going to be awesome! At the upcoming June show, I will also be showing a yearling colt, Windy's Kiss This Impulse, for my client, Tracey Coyle, from Pennsylvania. This is a very well-bred, buckskin with a blanket colt, and we know he will show well.